Hi! 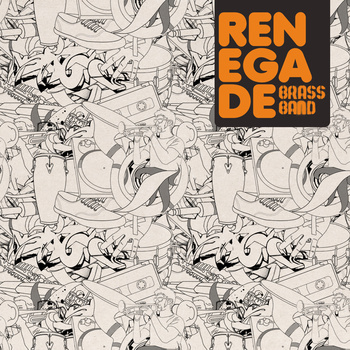 This time I listened to Renegade Brass Band’s EP, Radio Rebelde. The band is a combination of 8 horns, 2 percussionists, a DJ and a live MC. They are a mixture of genres with the great characteristic elements of brass instruments: Latin jazz, fusion, hip hop and funk. The aroused feelings go from dancing to remembering places such as Brazil, New Orleans and New York. The combination of horns and percussion gives the idea of Brazilian “Batucada”, being a collective or band such as a New Orleans’ marching bands and visualizing the street where the renegade New Yorker hip-hop hepcat meeting takes place (oh, now I got the name! I guess). And if you take a look at the cover, you might confirm this, so I dare to say all that was the main driving force of this fabulous EP. It’s show time! So let’s go a little deeper within each song. There are 5 songs in this EP, Radio Rebelde, and each one is complex with its own similar mixture. The first song is called ‘Barrio’ and that is the one the reminded me of a “Batucada”. I couldn’t help but move my shoulders and feet while listening to this song then, I gotta confess, I left my chair and danced. Then I listened to the second song: ‘Take No Chances, Make No Changes’. The first thing that popped up was the extract from the undercover radio station, “Radio Rebelde”, during the Cuban revolution and then the MC began rhyming and singing with the horns accompanying and the percussion keeping the pace. For me, this song represents rebellion and stand up for something better but with a colourful atmosphere. Next on the list is ‘Junktion’, which begins with a nostalgic tune (as a New Orleans big band playing for a funeral) but then the drums begin a different and more enthusiastic beat, so the song texture goes up and ends in happiness. There is the remix version that lost the idea of the funeral and it feels like electrofunk all the way from the beginning. And so we get to talk about ‘Nah Mean Nah‘M’Sayin’’. This song is the kind of hip hop that transports you to the street, that represents renegade people, but there is also the brass element that gives you a more cheerful beat, a wingman to your statement. Well, so they said I would love the Renegade Brass Band and sure I did. It’s a great and original collective and the mixture of genres brings a very complex but well structured and danceable music. Lots of kudos. Posted in reviewsTagged Brass, Funky, Radio Rebelde, Renegade Brass Band, SheffieldBookmark the permalink.